This story of Sony and its founder Akio Morita. Certainly different from most of the American business stories we get to read. The book is a 1998 edition and Sony, Japan and the world had undergone a sea change since. But most of what Akio discusses in this book had remained intact. He starts the with the world war era followed by US occupation and how it changed Japan during those days. It was in these days that Akio, son of a prominent business man started with the idea of a company. He had developed a solid technical foundation in engineering and sciences working for the imperial army that later helped in setting the Sony company. The book has vivid stories of how the first tape recorder takes shape and many of the now defunct transistor radio, VCR and walk man. The book gives insight about the world before the transistors when the vacuum tube ruled the world. Details of how Sony was established in America and Europe is quite interesting. The books delves into the psyche of a Japanese business as opposed to the American way of business. Written in the 80s , the book has little reference to the business world as we know today with WTO . Its surprising to note that the book has very little information about the technology we know today with the Internet and the personal computers and mp3 players and cell phones. What’s more relevant to note in the recession ridden world of today is the the frugal lifestyles of Japanese businessman. While US CEO earn millions in pay and perks, Japanese CEOs earn many order less than the Americans. Interesting to note that Akio mocks the US culture to sue. Millions spend by US corporations to save their back from frivolous lawsuits could be used for in R&D and adding value to the customers. It took me relatively a very long time to complete this book. I’d bought it this march and started reading it them. However during this period, I happened to read few other books. Its been a long time since I wanted to read about southwest. An airline that could withstand all the turmoils faced by the airline industry. A lot has been discussed and written about southwest in the web and all over. This one is a well written book and speaks volumes about the “Positively Outrageous Service” and what keeps southwest apart from a regular airline. 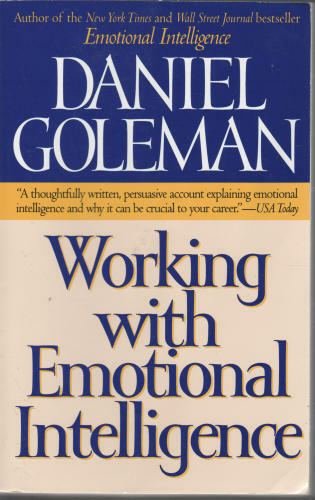 This book by author Daniel Goleman is a classic and a must-read for every employee. The book specifically looks into the emotional competencies required at workplace. As a manager I’ve often seem non technical employees excels in their work where as technical and many of the intelligent employees fail. All of these skills are definitely attributed to emotional intelligence. I follow the blog ‘http://www.manager-tools.com/&#8217;. This blog/podcast refers to the concepts referred to in this book and is an excellent resource for budding managers. One of the noteworthy subject in this book is about reference to Amyglada. A little gland in your brain controlling emotions such as rage, fear, anxiety. This is a really interesting read, where the author in details talks about the way this organ controls the emotions.